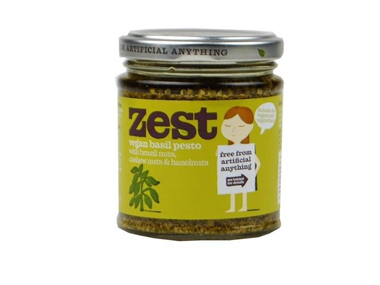 Buy Zest Vegan Basil Pesto - 165g in the UK from our online shop or directly from our independent Scottish store. Tempeh is made from fermented cooked soya beans. It is very popular in Indonesia and other Eastern countries. The firm texture and slightly nutty flavour makes tempeh a flavoursome alternative to tofu. This recipe contains 200 g pesto sauce. Another warming soup. Soups are great meals if you serve them with some (rye) bread spread with almond butter, butter, margarine or cheese. This recipe contains 4tbsp green pesto. Another Dutch 'stamppot' dish. Yes, we sure like our mashed potatoes! This is a vegan recipe but can be made vegetarian by using cheddar cheese, milk and butter. This recipe contains 1tbsp pesto. This recipe contains 4 tbsp pesto. Where can you buy real Vegan Pesto - 165g safely online? If you are wondering where you can buy Zest Vegan Basil Pesto - 165g safely online in the UK, then shop with us. Vegan Pesto - 165g - Zest Vegan Basil Pesto - 165g in Table Sauces and Table Sauces & Condiments.